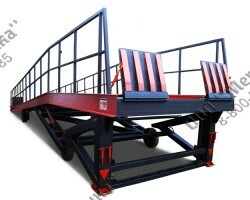 Mobile ramps are designed for loading/unloading of railway trucks. Such railway car carriers have two levels of loading to which the rack shall be adjusted. 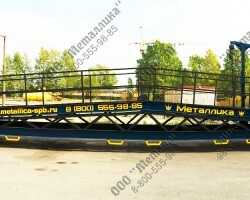 Construction of "Salamander" ramps is quite difficult, because the altitude range is rather large, so there are many nuances, turning angles, workers’ safety, and reliable interconnection with carriage, transportation, security and reliability of the design as a whole. Shipment is possible in the vehicle of the customer or by a hired transport company. Our managers arrange delivery of any rack directly to your site through proven logistics companies and at a good price. Delivery is carried out in all regions of Russia, CIS and Europe countries (see the geography of deliveries through the link:: Link). If you are ready to provide your own transport for shipment, then the loading is done by our company and is absolutely free! 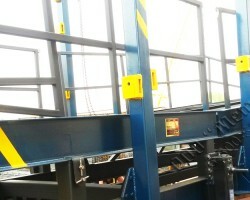 Manufacturing mobile ramps for the railway transporters takes 20 working days!